I think I’ve been pretty clear that I really like good BBQ. I mean really like good BBQ. Whenever I pass a BBQ joint or roadside stand, I want to stop. I don’t always do it, but I always want to. I never really had much of a reason to drive to the north side of Kalamazoo until I started working in Grand Rapids. Some days, just to do something different, I take US-131 Business instead of going around town. On one of these trips, I passed a BBQ joint just north of downtown and have been looking for an excuse to go back since. The BBQ joint in question is TNT – A Touch of Soul. Don’t go looking for a sign though. When you drive by, the sign actually reads Miller’s Smokehouse. I have no idea why that sign is there or why it hasn’t been changed because from what I can tell TNT has been open at least a year if not longer. The restaurant is on North Westnedge just south of Frank Street in Kalamazoo’s Northside Neighborhood. 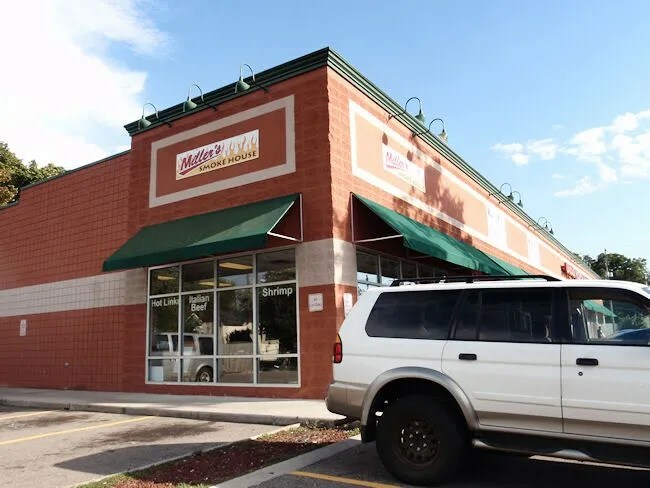 The restaurant takes up the corner of a strip mall that looks like it was built fairly recently. Like most BBQ places, there isn’t much of a budget for advertising or decor. The sign is printed on a standard sheet of printer paper and taped to the door. The lone menu was printed off someone’s computer, lamenated, and stuck to the counter. The space is mostly empty with a few booths along one wall. The order area is in the back of the space next to the kitchen. In one corner of the restaurant, it looks like they are sharing space with a baker who had some homemade goodies for sale. As soon as I opened the door, I was warmly greeted by three people behind the counter. As I made my way to the counter to find a menu, they asked if I needed a suggestion. I must have gave off the vibe that I had never been there before and they were ready to tell me what was the best thing on their menu that day. I noticed a pulled pork sandwich on the menu and asked how that was. The cook called it “off the chain,” but the cashier was really pushing me towards the ribs. I’m sure the ribs were delicious, but I’m still a pulled pork fan. Initially, I ordered two sandwiches which also came with fries, but I started looking around and didn’t see a credit card machine. I was going to be nice and bring one home to J, but I didn’t have enough cash for both. I asked before they started making the sandwiches if they took plastic, but they said no, so I had to cut it back to just one sandwich which set me back exactly five bucks. The pork was already smoked and waiting for me in a hotel pan, but the fries needed to be cooked, so I took a seat and waited. It only took about five minutes to hand me the Styrofoam to-go container and a whole handful of napkins. I headed home to eat because I was technically on my lunch break. I got sent back to Kalamazoo for work and since I hadn’t seen J all day, I decided to go home to eat dinner. I felt bad when I walked in with BBQ and didn’t have one for her, but she forgave me and took a bite of mine to see if it was worth going back for. The sandwich was a mess. They overfilled the bun and slathered on a thin, sweet BBQ sauce. Right away I knew it was going to be a sandwich I’d need a fork for. The meat reminded me more of a Carolina-style chopped pork sandwich than a Memphis-style pulled pork. The meat was cut into little chunks and covered in sauce. I had a lot of burnt ends in front of me which always makes me happy. The sauce was pretty sweet, but not overpoweringly sweet. J said she really liked that and wouldn’t mind getting a whole sandwich for herself. The fries weren’t anything special. They were typical restaurant fries, but combined with the size of the sandwich, I didn’t have to worry about going back to work hungry. In fact, I could have used a nap. 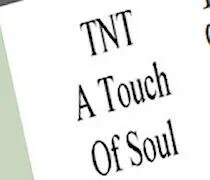 TNT – A Touch of Soul has a pretty good thing going for them on the north side of Kalamazoo. 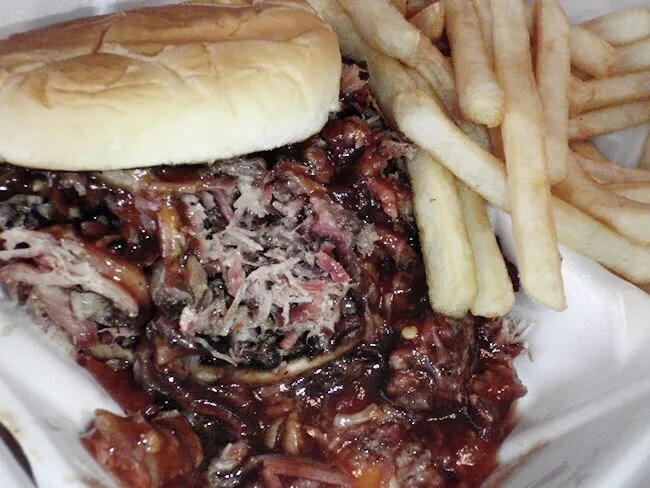 The menu isn’t large by any means, but the BBQ is the focus of their operation. It’s pretty solid BBQ with a sauce that J and I both like. There’s always a lot of people hanging out in the parking lot of this strip mall. There is a barbershop there as well which was packed when I was there, but I like to think they’re just soaking in that BBQ smell.